As counterintuitive as it may seem, I actually find myself doing a lot of cooking in the summer -- and quite a lot of baking. This occurs for a number of reasons. 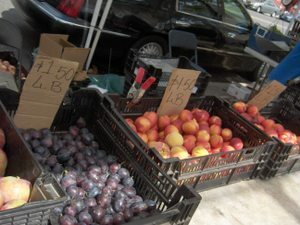 One is that the farmer's markets have all that good produce, and we can't just eat it all raw all the time, now can we. Another is that we get invited to parties and barbecues and weekend houses, and I like to bring things I've made, which are undoubtedly always the most welcome of gifts. But sometimes, even when I've made the dough for the World Peace cookies ahead of time, the thought of lighting the oven is unbearable. And then, of course, there's that forementioned fresh green produce that I already overbought at the Greenmarket. My favorite solution in that case, especially if it's for a picnic or barbecue, is a salad lightly thrown together of barely cooked and raw vegetables, a bit of pasta, lots of herbs, and a fresh, flavorful dressing. It's hard to get people to agree on much of anything, but a fair number of them seem to have arrived at the conclusion that pasta salad is a positively horrid article. There must be some people who like it, however, since deli counters and luxury food shops are full of the more loathesome versions of it, namely things like cold tortellini in cold pesto, neither of which are items that were ever meant to be eaten cold. This salad, however, is one that I make every summer, and with any and every summer vegetable that I can find. Try not to think of it as a pasta salad. Think of it as a market salad, composed of all the things that are freshest and best at the farmers market on the day you're making it, along with some cooked pasta to give it ballast. My only regret about this iteration of it, which I made on Saturday, is that I wish I had cooked the vegetables a tiny bit less. I actually didn't cook them much at all, and the snap peas and the peppers (not seasonal, but I had a red one in the fridge, what can I say) are actually raw. But I had asparagus and English shelling peas and little zucchini too (first of the season, still nutlike and sweet). And although they were as verdant and crisp and lovely as they appear in the photo above, I wish I had actually just blanched them, plunging them into boiling water for perhaps a minute, then shocking them in ice water to freshen up. However, the party of eleven to which this was fed were unanimous in their praise, and we heard no mournful tones at the appearance of pasta salad. Really, although I thought the vegetables could have used one minute less, the assembled company just wanted more. This is the version I made last weekend, relying on what was in the market (and that lone red pepper in the fridge). My usual template is little carrots, small rounds of young zucchini, pepper strips in many colors, whole cherry or grape tomatoes, some olives, and the pasta. But this incarnation was even better. Make less if you're serving less. This has a shelf-life of about 24 hours -- its deliciousness decreases exponentially with time. Or keep cooked pasta and cut/cooked veg in separate containers, and dress smaller portions right before serving, if you're going to eat this over a few days. Place onions/scallions and garlic in the bowl of a food processor, and process until finely chopped. Add everything else, and whiz till emulsified. Taste for seasoning, and add whatever it needs. It should be fairly highly seasoned, since it's going to flavor all that pasta -- but not so heavily flavored that it masks the sweetness of the vegetables. Reserve. Just before serving, toss everything together. This is a salad that's best when freshly dressed -- it doesn't need to marinate, and doesn't really benefit from it. Taste for seasoning, adjust, and serve. This all started with a shipment of grapefruit. I'd ordered some of those super-sweet, low-acid Texas Ruby Reds for various family members, so of course we needed a few for our mean selfish selves. I figured a little mid-winter extravagance never hurt anyone -- except maybe people who are as sabbatical-poor as we are at the moment. Ah well -- gone is gone, wisely says the old story my mother used to read to us. Then I took a fateful trip to Fairway, where I saw that my favorite Temple oranges had come into season. I love their zipper skins and the bright, tangy pop of their juice exploding in the mouth. And they don't cost much -- 3 for a dollar, a veritable bargain. So into the cart they went. Then, once inside, I saw the loveliest thing -- a whole box, an entire 2-pound plastic clamshell of Meyer lemons for only $5! Why, I remember only a few years ago, when I had to dig around for a few lonely specimens that cost the earth, more than three dollars apiece. Now I can ponder lovely things to do with my huge stash of Meyer lemons. Dangling on a display post nearby was a net bag of Sicilian Tarocco blood oranges. You see, I've never had the Sicilian kind, only the California clones. And I am therefore deprived, a situation which now could be so easily remedied for a mere $3.49, a pittance. And then, next to them, I saw a pile of Cara-Caras. Never mind that these still really and truly cost the earth. I wasn't leaving without at least six of them. 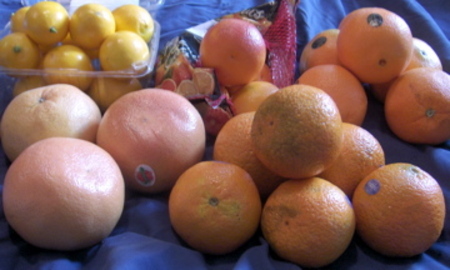 So, many dollars lighter, few pennies left for other groceries, we find ourselves in the midst of a veritable citrus glut. Never mind that we're not going to get the Locavore of the Year award any time soon. At least no-one around here is coming down with scurvy, not on my watch. Nothing great is created suddenly, any more than a bunch of grapes or a fig. If you tell me that you desire a fig, I answer you that there must be time. Let it first blossom, then bear fruit, then ripen. I have eaten fresh figs in the past -- but somehow I had never really eaten a fresh fig. Or maybe that sentence should read "...somehow I had never eaten a really fresh fig." Until yesterday. It was a completely serendipitous moment: a visit to the Connecticut home of old family friends, now quite elderly. Their daughter, my friend Wendy, had flown in from Chicago, and called to ask if I would come up to visit while she was in town to celebrate her mother's birthday (and it was indeed a birthday of some note). We have many strands of connection. Wendy's mother had been my own mother's closest, most sister-like girlhood friend. I was the flower girl at Wendy's wedding. And these are the friends who generously offered their beautiful home as the venue for one of our own wedding parties last May, gorgeously situated at the top of a hill overlooking the Long Island Sound. When we're all together, I am always pierced with that sense of missing my mother in the company of others who also miss her, deeply and daily. It's the sort of bittersweet feeling you would rather have than not have. Before I left, I was told that I must go out and gather some figs to take home. Never one to turn down an opportunity like that, I asked Wendy to come outside with me as her parents went off for their afternoon rest. "Won't they miss these figs?" I asked. "No," said Wendy. "They have so many, they don't know what to do with them." Oh, to have a fruit tree. 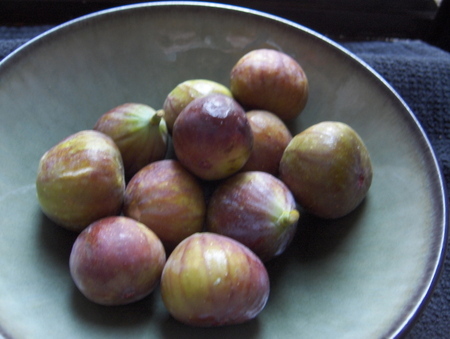 The figs were ripe and perfect, and I popped a little one in my mouth as we picked forty or so of them. I was surprised. They didn't have the insipid sugary flavor that I've come to associate with figs, even fine, farmers' market specimens. These were complex and floral, with a lovely tang countering the sweetness, a bit like fresh ripe berries but with their own fibrous figgy texture. On the train ride home, I ate more of them. And despite the fact that recently I've been baking up a storm, and that our kitchen contained no less than three different homemade goodies -- pumpkin apple streusel bread, scented madeleines, chocolate-coconut-almond bars -- more figs were what I wanted for dessert last night. I don't know why they're so different from any other figs I've eaten. Is it simply that they were ripened on the tree, and picked so recently? If so, then these are the only sort of figs that I ever really want to eat. I might have been a momentary purist, and said that I only wanted figs for dessert last night. But if the truth be known, the figs are also very very good with those scented madeleines. If you don't know the glory of fresh shelling beans, it's high time you learned. Now is their moment; you really don't have any time to waste. 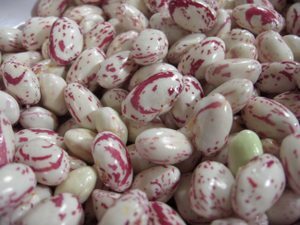 Shell beans are at their height in your farmers' market, as is the last of the corn, which will initiate you into the mysteries of succotash -- and I'm not talking about the nasty packets of frozen stuff you were forced to eat as a child. At the moment, my favorite shelling bean is the lima bean. It's no wonder that some varieties are referred to as "butter beans," especially in the South. They are so tender, so starchy-yet-creamy, so perfect. Yes, yes, I know all about your childhood trauma and how much you hated them, there on the plate next to the overcooked liver and how you had to sneak all of it to the dog in order to get your Kit-Kat bar. Yeah, me too. It's time for us to get over it. We have now evolved to the point where we like the lima beans better than the Kit-Kat bar, especially when they're fresh. Even if it may cost a manicure or two to get them out of their pods. While fresh peas probably still reign supreme in my legume affections, I prefer fresh lima beans to cranberry beans, although I love the little red-splotched guys too. But it's the texture of the butter beans that wins me over. With these beauties, it's important not to err on the side of undercooking -- you don't want even one bean that is gritty or crumbly rather than meltingly tender. Vegetables like fresh lima beans provide the perfect opportunity to slow down. Instead of using pre-washed salad greens and pre-peeled garlic and frozen vegetables and all those other conveniences on which we rely at times in the name of getting a meal on the table, today you can decide that you will slowly, meditatively take the time needed to choose the best, firmest green pods. Then you start shelling, working your way through a couple of pounds of the twistilinear hulls, noticing that your yield of beans is, sadly, quite a bit smaller than the growing pile of spent pods next to you. You have to figure out the best way to open them -- can you slit one side with a fingernail, and pop out the beans? Sometimes these bean-husks are too resistant for that, and you have to break off an end, and see if you can peel a thread of membrane along one side to get the pod open. And other times you just have to fight and wrestle with it until you can get those babies out of there, slightly bruised or nicked but none the less delicious for that. Although they're more work than my beloved English peas or the prettily painted cranberry beans, they're actually far less effort than favas, with just as great a reward, at least in my opinion. And once you're done with the pesky shelling, some very succulent dishes are but a few minutes away. My current favorite, as you've no doubt guessed, is succotash. The Northeastern Woodland Indians created this particular vegetable mixture, which serves as just one tiny example of how much has been lost by the suppression and destruction of tribal knowledge. Beans and corn together (and sometimes squash, for a perfect "three sisters" vegetable dish) balance each others' nutrients. The beans and squash both provide niacin, as does the process of treating the corn with lime, also known as "nixtamalization," another Native American invention. If corn is a major part of one's diet, and is not nixtamalized nor eaten with niacin-rich foods, dire circumstances may result. The early inhabitants of this continent knew how to balance the grain. 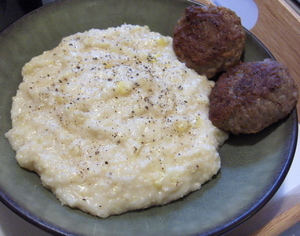 Not so southern Europeans, and most particularly the Italians, who when first introduced to corn (and hence, polenta) in the 18th century, became so fond of it that they ate it to the exclusion of many other foods, and developed pellagra -- as did many inhabitants of the southern United States during the 1900s. Succotash is worth the effort not only for the superiority of its balanced nutrition. I truly think it one of the most delicious things you can eat in the early fall. If you wish, leeks or green onions are good additions, as are the last few summer squash or green beans. 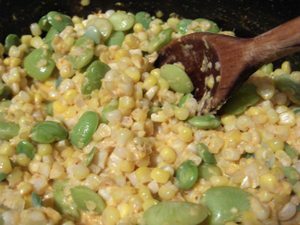 I prefer it in its simplest form -- corn, beans, a little butter, a soupçon of good cream, salt, pepper, and a generous lashing of piment d'espelette, or failing that, ground cayenne pepper or red pepper flakes. This could also be easily adapted to any dietary restrictions -- the cream isn't strictly necessary, although it creates a lovely bit of sauce, and the butter can be replaced with a splash of olive oil, if you don't use dairy products. However you modify it, take a moment to slow down, and give fresh succotash a try before the frost sets in. serves four to six moderately, or else just two people who can't believe how good this is. 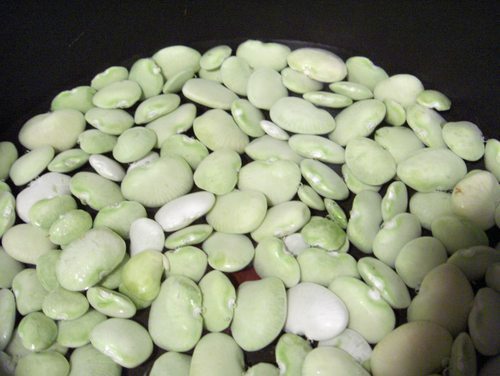 Cook the limas in about an inch of boiling water, until creamy and tender. This could take anywhere from 10 to 25 minutes, and you can only really tell if they're done by tasting them, since cooking time will vary due to the size and age of your beans. Drain them and reserve. Melt the butter in a medium sauté pan or skillet, and let it brown just slightly, until it foams and has a nutty smell. Gently add the corn kernels and sauté for about five minutes or until the corn seems done (again, this will be dependent on the size and maturity of the corn kernels). Add the beans, the cream and all the seasonings, and simmer together for a couple of minutes until the cream is thickened, and all the ingredients have melded a bit. Taste, and only add the dash of sugar if the natural sweetness in the corn and beans needs a tiny bit of heightening. True confession time: I'm not really sure I know what the taste of umami is. I know that as a certifiable-type food blogger, I'm supposed to know these things. But truthfully, I'm a little skeptical of all these Americanos who grew up on ring-dings and are now waxing poetic about the joys of umami -- which, admittedly, is "subtle and serves to enhance other flavors." It's one thing, I suppose, if you grew up in Japan with lots of bonito flakes and dashi stock and all. Then it would be something that you knew and understood from birth, and you would come to associate certain foods with it. But whenever I try to figure it out, I see lists of foods that are as divergent as anchovies and peas, for example. Or corn and seaweed and Parmigiano Reggiano. Carrots, truffles, foie gras and green tea, too. All of these are positively loaded with umami, it seems -- but don't have a lot else in common taste-wise, as far as I can tell. Being loaded with umami means they're high in glutamates, an amino acid compound responsible for the flavor of umami. Yes, glutamates, as in monosodium glutamate, the compound of which the seasonings Accent and Ajinomoto are composed. Yes, monosodium glutamate, the evil element supposedly responsible for "Chinese Restaurant Syndrome," which resulted in Chinese restaurants posting "No MSG!" signs in their windows for the past 30 years or so. Now the debate has re-opened and apparently MSG is no longer evil or dangerous. None of this helps me get any closer to pinning down the elusive flavor of umami. I know I'm getting closer; when I let go of the skepticism and try to get at exactly what it is, I know it's a savory something. Savoriness, I guess. Which I tend to associate with saltiness, so there I am back at four tastes instead of five. I remember my grade school science class, where they wanted to teach us the four tastes. We were given tiny samples of salt, sugar, a lemon wedge and a square of unsweetened chocolate; they were the elemental foods for salty, sweet, sour and bitter. I don't know how they're going to teach that lesson nowadays, short of giving students a nice heaping helping of Accent straight from bottle as the representative sample for umami. The fifth taste was discovered by this fellow, and more recently scientists verified that there is a receptor for umami on the tongue. But I still don't have it pegged yet. If you do, please help me out. Describe it for me -- or give me an example of a taste that's the quintessential flavor of umami. In the meantime, I'll give you this recipe for a fresh-from-the-market vegetable sauté that we ate the other night. I know it has umami-rich tomatoes and carrots; I can't vouch for the glutamate content of the other ingredients. All I know is that when you eat it, you too will say ooooooh, mami. Heat the butter or oil in a large, deep sauté pan or pot. When the butter or oil is hot, sauté garlic for a few minutes, until it just starts to turn golden. Add tomatoes, and let them cook down a little until they become a chunky, rustic sauce. 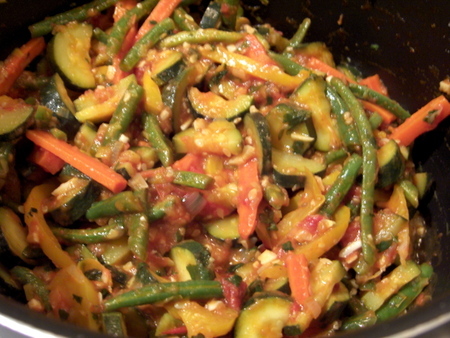 Add the peppers and cook a few minutes more; add the zucchini and cook another minute. Add the partially-cooked carrots and green beans, and let everything cook together until vegetables are just tender to the tooth -- or to your taste. Season to taste; snip cilantro in with a scissors and stir through to release flavor. Just before serving, taste again and adjust seasoning. Peaches are female; I've always thought that. I suppose all fruits are, since they are, after all, the bearers of seeds. Ovaries, basically. But there's just something particularly femme about peaches, not to say that real men don't eat them, of course. Peaches are what bring me here today. Not just peaches, but naked, blushing, jewel-tone peaches suspended in a richly scented cream custard above a blissfully crumbly crust. Naked, you ask? Yes indeed. At first, of course, your sweet peach is softly, delicately fuzzy -- but then, oh then, you coax her to slip off her skin, and take a warm bath in cream. I've been thinking and dreaming and envisioning a sort of peach-cream-custard-tart dessert for weeks now. I kept buying bags of peaches and nectarines at the farmers' market, tenderly giving them their last day's ripening in a paper bag, planning their transformation into peach-cream-custard-kuchen. But I still wasn't feeling great for a while there and it was hot, too hot for oven-lighting, so I ended up happily eating them out of hand or sliced into bowls, topped with Greek yogurt and drizzled with a tiny thread of wildflower honey. So good. This may be one of the first summers in recent years when I've almost, almost gotten my fill of peaches. Corn and tomatoes, berries and melons croon their summery songs, and gladden my heart and my mouth. But the ripe, drippy peach is summer's quintessence. And although these days there are many mournful screeds about summer's end, there are still peaches in Northeastern U.S. farmers' markets and farm stands. Gather them while ye may. So I didn't make this dessert I'd been envisioning, and I still didn't make this dessert. Then, however, two things happened. The mercury dropped back down into the 70s, and we had friends over for dinner. Not just any friends, but the darling friend who a) threw me the loveliest and poshest bridal shower ever, b) gave me her mother's gorgeous antique gold mesh bracelet as a shower gift, c) along with her husband, did all the flowers and decorations for the larger of my wedding parties and d) again, along with her husband, gave us our beautiful wedding night at the London Hotel in midtown. And that's just what she's done for me recently. Not only that, but her husband is my husband's very clever and hard-working business partner. Last but not least, these friends are living at the moment in a studio sublet while they wait for lagging contractors to finish renovations on a new home. All their meals are restaurant meals or take-out, so a home-cooked dinner is a huge treat for them these days. Lots of motivation here to pull out all the stops: truffled foie gras mousse brought back from our recent trip to Montreal, thick (antibiotic and hormone-free, vegetarian-fed beef) porterhouse steaks, fresh corn, a farm-stand vegetable melange so delicious it could be a meal in itself, and dessert: skinless naked blushing cream-custard-cloaked crumbly-crusted peaches. Often when I conceive of a new recipe, I play around with it too much, and it doesn't quite come off as planned. Not being a food professional, I generally don't have the wherewithal to test and re-test something until it comes out just right, so instead it waits for me to make it again, by which time, if I ever do get around to it, I may already have forgotten what wasn't right in the first place. This time, however, I got it on the first try. I might modify it on another go-round: try nectarines, add some berries to the stone fruit, use a different kind of sugar and maybe just a tad more, since it's not too sweet. But really, it's just so exactly what I had in mind that it may overcome even my relentless desire to tinker. Really a large tart, this has its roots in an old recipe from Edward Espe Brown's The Tassajara Bread Book, a slim tome which slightly pre-dates California Cuisine but in which you can find much of the thinking that informs our current foodways. I made enough changes that I'm pretty sure it's become my own recipe: cutting back on the sugar, ditching the cinnamon and replacing it with nutmeg, since cinnamon is generally overused in fruit desserts (it doesn't really suit the peach's delicate floral nature -- although a bit of nutmeg does); adding excellent peach liqueur (Mathilde) and vanilla in the form of vanilla sugar in order to enhance without overwhelming; blanching the peaches and leaving them in their round pink-cheeked halves; changing the proportions to create a higher ratio of fruit and custard to crust; and finally adding a sprinkling of crushed amaretti to soak up juices and provide another layer of flavor. So it's related, but not really the same any more as the original, which (despite its Zen Center pedigree) I suspect may have had its roots in an old Betty Crocker cookbook -- where I found even earlier references to something remarkably similar. But enough blather. I cannot recommend more strongly that you act now, before peaches disappear from your local farm stand or market. Trust me, you'll have plenty of time to play with apples, or even plums. The window for peaches in all their golden-pink pulchritude is rapidly closing; there's just about enough time for you to enjoy a last fling with these lush orbs. Even G, who places himself firmly and manfully in the camp of apples, thought this dessert was a winner (of course, he also thought it would be even better with a creamless filling of apples and a judicious layer of crumble on top, thereby resembling the original only in the pat-in bottom crust, which was, in his words, Best. Crust. Ever). Go now and get those peaches, strip them of their skins, crust them, cream them, bake them -- and then tell me whether, girly fruit or no, this dessert is not beloved by all, gender prejudices notwithstanding. A few notes: you've already seen from the pictures that this is not really a "presentation" dessert. It's not going to have the drama of a gorgeously decorated cake or pie, but I strongly recommend it for guests or a special occasion dessert because it's so damn delicious. Think of it as a homey sort of thing which can be dressed up to your heart's desire with fruit slices or fruit coulis or mint leaves at the plating stage -- if you wish. In our case, the eagerness to begin snarfing it down prevented us from playing frou-frou with it. I don't recommend serving it with ice-cream or whipped cream as I've seen suggested in some similar recipes. There's plenty of cream in there already -- oh, and in case the dessert police are after me (hi bro!) because of that 2 cups of heavy cream, please remember that this makes a LOT of servings. Practice portion control, and realize that you're consuming far less cream than you would if eating a piece of pie served with a scoop of ice-cream -- unless it's a very small scoop. As always, quality ingredients (preferably local fruit and organic dairy goods) make all the difference between a dessert that is transcendant and one that is merely good. Preheat the oven to 400F. Butter a 9 x 13 inch pan, line the bottom with parchment paper, and butter the parchment. Blanch the peaches: submerge them in boiling water for 30 to 60 seconds, then plunge them into an ice-water bath. The skins should slip off effortlessly, leaving the blush on the peach flesh. If they're still hard to remove, give them another 30 seconds in boiling water. You don't want to cook them, however, since they'll receive plenty of cooking later. Once peeled, cut them in half, stone them and place in a bowl. Sprinkle with the optional peach liqueur. Place flour, 1/4 (or 1/3) cup sugar, salt and baking powder into the bowl of a food processor. Pulse in butter until the mixture is blended, somewhere between "little peas" and "cornmeal." Press gently into the prepared pan, covering the bottom and going up the sides about 1". Place the amaretti into the workbowl of the food processor (it is unnecessary to wash the food processor between tasks for this recipe). Process until you have a coarse rubble. Sprinkle this over the bottom of the pastry-lined pan. Arrange peach halves, rounded side up, in 5 rows of 3 peaches each. You'll have 3 halves left. Slice two of them into thin slices, and tuck as many of them as you can between the peach halves. Reserve the remaining half and any extra slices, as well as all the juices/liqueur from the bowl of peaches. Sprinkle the peaches with 1/2 cup of vanilla sugar. It will seem like a lot when you're sprinkling, but it's not. In fact, if you have a sweet tooth, you may want to add the greater quantity of sugar here, since this is not a particularly sweet dessert. Place the pan in the center of the oven, and bake for 15 minutes. While the crust is baking, place the reserved peaches in the food processor workbowl, along with all the accumulated peach juice and liqueur. Process into a purée. Add the cream, the eggs, the egg yolks, the remaining vanilla sugar, and the nutmeg. Process until well-blended, about 10 seconds. Remove the pan from the oven. Don't be alarmed if there's lots of liquid in the bottom of the pan; the bottom crust will still become crisp and flaky. Pour the cream mixture evenly over the fruit and return to the oven for 15 minutes, then lower heat to 350F and bake for another 15 minutes. At this point, the custard in the center should be just barely set. If it's still liquid, continue baking, checking every five minutes for firmness. You want the custard to be set, but just barely, as it will continue to cook when you remove it from the oven. When done, take it out and let it cool in the pan. Cut into squares, each one containing a peach half, and serve. This is probably best eaten the day it's made, but it was still delicious and crisp-crusted on the second day, after a night in the fridge. There's nothing quite like a farmer's market to help a girl recover her appetite. Even better if, while still suffering a bit from post-illness weariness, all she has to do to get there is walk across the street. Earlier this summer, G returned from a Sunday morning errand bursting with momentous news. "You'll never guess what's right outside. It's your idea of birthday and Christmas and Sunday morning miracle all wrapped up into one. C'mon, guess." "Oh," I said, coming up with the most preposterous, unlikely idea I could muster, "ummm, well, suddenly, miraculously, masses of fresh locally grown produce are directly outside our door. Like, there's a farmer's market outside, on our street." "Yes!" G howled in delight. Not that it actually made all that much difference to him, since I'm the one that's in the throes of local produce obsession. And actually, having a Sunday farmer's market across the street is probably a bit of an annoyance for him, since it cuts down parking options on our block. But he was thrilled on my behalf, and of such emotions are good marriages made. And maybe at least part of the thrill is on his own behalf. After all, he does enjoy his share of whatever I cook up from the fresh provender -- especially if it's collard greens, and extra-especially if it's corn. Now when I say "farmer's market", you have to understand that this is not Union Square we're talking about. This is East Harlem, and the market consists of 2 stands. That being said, between the two we're offered a pretty nice variety of whatever's ripe on the farm. One of the farmers is originally from Mexico, and in addition to today's peaches, nectarines, plums, apples, pears, grapes, tomatoes, peppers and other fruits and vegetables, he was offering tomatillos, a couple of different kinds of hot peppers, cilantro and several herbs that apparently are traditional in Mexican cuisine which I've never seen at any other market, including Union Square. 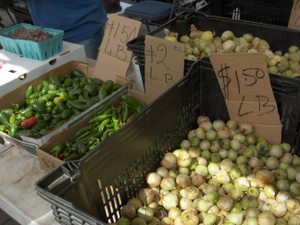 Both farmers offer their bounty at very reasonable prices, keeping their produce within reach of those who might not be able to afford the offerings at more boutique markets. While the produce is not organic, the farmers have been willing to have some conversations with me about their growing practices. They do make the effort to avoid heavy chemical pesticides. Interestingly enough, they do this because it's more cost-effective for them, or so they claim. Pesticides are expensive, and if the customer isn't necessarily turned off by a few bug holes in the collard greens, why not avoid them? 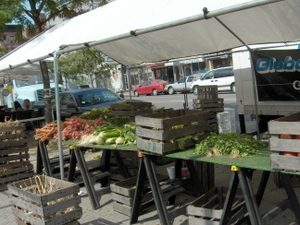 Our neighborhood also has a slightly larger Thursday market, a few blocks further away, which attracts 3, maybe 4 farmers. Occasionally the nice people from Bread Alone are there too, as are the folks from Cornell Cooperative Extension, who operate a small table where they do cooking demonstrations, give samples of the foods they've made with seasonal produce, hand out recipes and offer information and other resources to the folks who come to look, and hopefully, to buy. These two markets are not Greenmarkets, however. They are run by a group called ANWA/Harvest Home (and I found so little information about them that I don't even know what that stands for) in collaboration with Union Settlement. How can I not love the fact that someone cares about whether or not the people in my neighborhood (most of whom are on fixed incomes or public assistance or just generally living below the poverty line, despite rapid gentrification) have access to fresh, local, seasonal food? Lest you should think I don't miss the precious baby sucrine lettuces and wild arugula and tri-star strawberries of Union Square Greenmarket, not to mention many colors of ugly tomatoes, well, of course I miss them. But I don't feel deprived, or not too much, anyway. Here's the thing: by nature, I'm someone who actually CAN have too much of a good thing. Especially when that good thing is something that promotes overspending and eventual waste. I'm sure others are capable of far greater restraint than I, but the the fact is, I rarely leave Union Square market having spent less than about $70, and my sense of being overwhelmed by gorgeous produce and specialty items (fresh sheep's milk cheese! Free-range quails' eggs! Teeny-tiny gold-nugget potatoes for $6 a pound!) leads me, too often, to buy more than we need -- and certainly to buy more expensively than we need. The true motive for shopping more locally (in my own neighborhood, that is) is that this year is going to be the year of living frugally. I'm on a sabbatical leave (translation: the portion of my salary that allows for any margin of luxury is the portion I'm not getting in the paycheck this year. My luxury this year is time, although we've been too encumbered by recent illness and annoying tasks for me to be able to feel or enjoy it yet). One becomes accustomed to living at whatever level one can afford, and spending accordingly. Cutting back is never easy; however, I'm up for the challenge of being a little more creative about our finances. It's important to be philosophical about these matters. By some people's standards, we're in dire financial straits. From the perspective of many, many others -- well, we're doing just fine. As one of my students recently said, it's all relatives (family members not withstanding). Occasionally I'm sure I'll allow myself the pleasure of a spin down to Union Square. But for now, while there's still corn outside my door at four ears for a dollar, I'll be factoring convenience and price points into the quest for healthy and local food. And what to do with that corn? Well, I'm coming round to the idea that perhaps less is more when it comes to preparing produce, too. G could happily eat steamed corn on the cob seven nights a week when it's in season. But me, ah, well, the quest for novelty is ever-present. Earlier in the summer I made fresh corn soup as well as several mixed sautés of vegetables that included sweet nuggets of corn nestling in among the squash and peppers and tomatoes. But I wanted something different from that too -- a dish in which the corn could be the star. With this in mind, I found a recipe for fresh corn polenta in Suzanne Goin's lovely book Sunday Suppers at Lucques. This seemed to me a capital idea, consisting, as it did, of sautéed kernels folded into more-or-less conventionally-made polenta (although Ms. Goin's is long cooked, with a high proportion of water). I couldn't even wait for dinnertime to try it out. I got up early the next morning and made a pot of excellent stone-ground grits and folded the sauteed kernels in along with some lumps and bumps of sharp Vermont cheddar cheese. Delectable, especially when sided with crisply fried sausage patties. Emboldened by this success, I went on, a day or so later, to try the dinnertime version with polenta. I knew I had polenta in the house, since someone had recently given me a packet as a gift. A packet whose label I hadn't read. A packet that turned out to be quick-cooking polenta. How bad could it be? I cooked it up despite my misgivings, folding in the fresh sweet corn kernels and some Parmigiano Reggiano, and served it up next to crisply sautéed filet of sole and green beans in a thickly simmered jam of fresh tomato, garlic and basil. I feel quite sure that the reason the polenta turned out to be such a dud-like bowl of gruel has nothing to do with Ms. Goin's excellent recipe. It's simply the gluey result one gets from instant-style polenta (conversely, I knew that the reason why my experiment with the grits had turned out so well was that they, unlike the polenta, were a coarsely textured stone-ground product). The addition of fresh corn to the polenta studded it with beautiful kernels of corny goodness which somehow didn't do a thing to mitigate its pastiness or provide any sort of much-needed flavor boost. It was merely, as G says whenever he considers something okay but not particularly delicious, "fine." "Fine," I thought. "I can still do something delicious with the leftovers," because leftovers there were, however gummily unyummy they might be. In my mania to conserve precious natural resources in addition to the dwindling resources inside my wallet, I simply had to use this stuff up. I though of a recent blog post I'd seen on Orangette that had, at its end, a recipe for polenta fries. "Great!" I thought. "Instead of making the polenta the way it is in Molly's recipe, I'll just use my leftovers and cut them into sticks and fry them. Perfect." No. Not perfect. Not perfect at all. I wasted an entire bottle of cooking oil, burned my hand and made my kitchen smell like fried food, something I studiously avoid any more than once or twice a year, tops. And all in the name of making these rather nasty fried logs of starchiness which, at first attempt, fell apart completely in the oil, and then, when I cleverly coated the next batch in cornstarch to make them stick together, burned and well, just weren't particularly flavorful, since the pap of which they were composed wasn't all that good to begin with. So again, please be advised that this has NOTHING to do with Molly's lovely recipe, which I did NOT follow, since I was using up leftovers and just going with the concept of polenta fries rather than her careful recipe. All I can tell you is that as G valiantly chawed through the crunchy but tasteless corn logs on his plate, I knew, despite his avowed love of corn, cheese and all things deep-fried, he could only be thinking "Why couldn't we just have had corn-on-the-cob?" There's a lesson in that somewhere. I'm aware that for the most part, my efforts to economize and use things up are rewarded with something delicious -- or at least edible. In this case, however, trying avoid waste merely led to waste: a whole bottle of wasted oil, wasted corn mush (lots of it got thrown away), wasted time and energy. In this case, the waste was caused by a low-quality ingredient: the instant polenta. Even though the dish might have been wonderful with real polenta, I think that for the moment, I'm going to stick with the less-is-more premise -- particularly when it comes to corn. 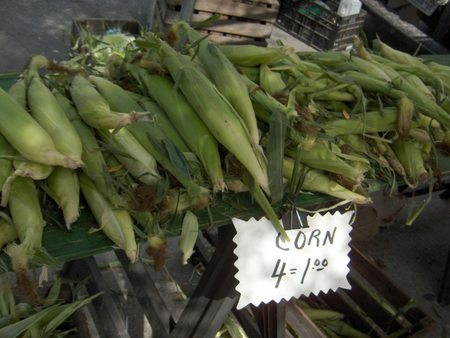 For the rest of the season, as long as the corn lasts, we'll enjoy simply steamed ears, sweet and milky and toothsome. And you, being wiser than I, will probably do the same even without my cautionary tale. However, in the event that you have a few ears left over from steaming, and you're in the mood for a corny breakfast (or for that matter, dinnertime) treat, the following is still well worth a try. Bring 2 cups of water to a boil. Stir in grits, 1 Tbsp. of butter, and salt. Return to a boil, reduce heat and cook slowly, covered for at least 1/2 hour, stirring every few minutes. Add more water if it becomes too thick. While the grits are cooking (please don't skimp on the cooking time -- long, slow cooking makes these better than you ever thought they could be), shave the kernels from the cob with a sharp knife. Sauté them until they become slightly browned in the remaining tablespoon of butter. Stir them, along with the cheese, into the hot grits. Serve immediately with black pepper ground over the top. We have been having quite the festival of fresh 'n' local produce chez AFIEP. What I've been enjoying almost more than anything else are shelling peas. I've eaten them raw, made them into mint-and-basil scented soups, risottoed them, cooked 'em lightly in the English fashion with lettuce, mint and butter, and tossed them with great success into a spur-of-the-market sautéed vegetable mélange of spring onions, green garlic, tiny squash, a chopped (early) heirloom tomato, some leftover not-so-good corn that found its metier in this medley, and a handful of wild arugula to wilt at the very end. The peas were still detectably sweet and delicious, even when combined with all those other good things screaming for attention (and by the way, it's good when vegetables scream for attention. It means they have so much flavor that you don't have to do a whole lot to them). The peas I purchased this morning are going to find their home with a medley of other greens in a charming tangle of homemade egg pasta with herbs, seasonal vegetables, and fresh Brebis Blanche sheep's milk cheese. But I'm here to talk to you today not about peas, but about G's clear favorite of our summer vegetable offerings: collard greens. 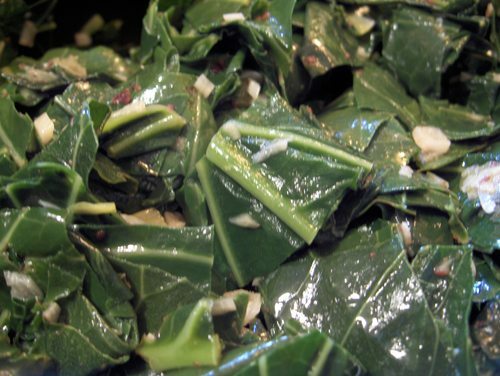 Let me say that as the white, Jewish, Yankee, newly-married wife of a man who grew up in Baltimore raised by a formidable clan of African-American Southern women, I have approached the making of collard greens with some trepidation. It wasn't that his mother or aunts cooked greens all that much -- or even cooked a whole lot at all. His grandmother, however, the venerable Nana (whose love for G is such that she actually left East Baltimore for the first time in many, many years in order to attend our wedding party) was apparently a genius at greens, as well as many other traditional Southern dishes. Now I love greens, and invariably order them when they present themselves on a (generally soul food) menu. I just didn't know if I could cook them. Turns out, I can. Instead of boiling them to death in pot likker, I created my own method. I cleaned them, cutting out the tough center rib, chopped them, and plunged them into boiling water. I let the water return to a boil, and then drained them very, very thoroughly. Then, in a judicious quantity of smoky, flavorful bacon grease (from some good bacon like Niman Ranch or North Country), I sautéed lots of chopped garlic (green at this time of year), some minced little spring onions, and a good shake of Aleppo pepper, as well as some freshly ground black pepper and a little coarse salt. When all that wilted down, I added the greens and cooked the whole mess together until the greens were tender and toothsome without a trace of their tougher nature, still with a slight resistance to the tooth and vibrant, not drab, in color. "These are the best greens," declared G the first time I made them. "The best greens ever?" I asked. "Certainly the best greens any white woman has ever made," he replied. Then I made them again, and once again, slightly refining the recipe each time. I used some mustard greens in the mix at one point, adding them in later since they don't need as much cooking as the tougher collards. And when I just couldn't help myself, I crumbled a little strip or two of bacon left from breakfast over the greens as I served them, just a little garnish, so the bacon would still have crunch. Finally, one night, over a plate of greens, my husband confessed what the dinner of his summer fantasies would involve: as much fresh corn as he could eat -- and a bottomless pile of these collard greens. For such a serious carnivore to request a vegetable-based dinner without a hunk of meat to center the plate seemed pretty significant. "Okay," I agreed. "As soon as the corn is really good, we'll have it." G took another forkful of greens. "I have to revise what I said before about these greens," he said. "They are the best greens anyone has ever made, anywhere." Please keep this information to yourself. Nana is very fond of me, and I'd like it to stay that way. Bring a large pot of water to the boil while you trim, clean and chop the greens. If you're using collards, cut out the tough center rib before chopping them into coarse ribbons. Plunge the greens into the boiling water. For collards, let the water return to the boil before draining them. For more tender greens, just blanch them for 30 seconds or so. If you're mixing them, put the collards in first, and then just before the water returns to the boil, add the other greens, wait a half minute, and drain it all, very very well. Heat the bacon fat in a large skillet (or you can even use the greens pot if you want to do fewer dishes later). Sauté the onion and garlic until tender. Add red and black pepper and salt. Toss in the greens just as the aromatics start to turn golden (let them color a bit -- it gives them a richer flavor). Toss everything together, and cook at a low heat for about five minutes, or until your greens are just tender. Adjust seasoning, sprinkle with crisp bacon and devour -- by themselves, or as part of a large dinner composed of all kinds of southern-style seasonal vegetables and perhaps fried chicken or baked ham, some cornbread or biscuits -- if you're up to making all that on a hot summer evening. Just make sure you have plenty of iced tea on hand. No matter what else you serve, the greens will still be the star. I was feeling rather dejected. Since I've been back for summer semester in the terrible, horrible, no-good, very-bad administration program (which has me sitting in an absolutely mind-numbing class from 8:00 a.m. to 4:00 p.m. almost every day), I hadn't gotten around to posting about this strawberry shortcake. I actually made it on July 4th, and my thinking was that since I'd hadn't posted, too much time had gone by and there probably weren't any strawberries left in the market. But then my brother called me this morning as he was walking through the Union Square Greenmarket on his way home from the gym, downtown dweller that he is, and I said, "What's in the market?" As he enumerated the kinds of produce he'd seen, and began to speak of berries, I thought I heard him say the word "strawberries." "Strawberries? Did you say strawberries?" said I. "There are still strawberries in the market?" "Indeed there are," he replied, "and mighty good they looked, too." Hmmm, I thought. There had been no strawberries last week, which had shattered my desire to post about this shortcake. But perhaps some of those clever farmers of day-neutral strawberries (those tricky little gems that bear on and off all the way till September) had wares for sale. In any case, even if strawberries are gone in your region, you might find yourself in the way of making this shortcake with other fruit -- raspberries, for example. I certainly wouldn't turn up my nose at a homemade raspberry shortcake doused with thickly whipped organic farm cream, the kind that's almost yellow, almost thick enough even before you begin to whip it...but I digress. I was originally inspired, 10 days ago or so, to make strawberry shortcake because of a charming post of the no-less charming Bakerina (whose recent blog makeover has given me a serious case of blog-envy). 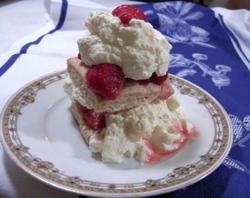 Claudia Fleming's tarragon-scented strawberry shortcake was mentioned, though not actually made. Alas! Even on the best of days, I am unlikely to find fresh tarragon in my neighborhood. And on July 4th, well, it was pretty much out of the question. But we did have strawberries, and what strawberries. We had just bought them from the Lebanon, New Hampshire food co-op, who had in turn acquired them from a VERY local Vermont farm (well, so, they were local when and where we bought them. But then, of course, we had to go and truck the entire shipment of one quart to NYC, thereby turning them into a non-local food -- to our everlasting shame). 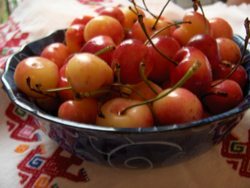 They were fragrant, medium-smallish, and deep red -- all of which meant that when we bit into them, they were intensely flavorful. So what to do with these berries, to just enhance them slightly but not mess too much with their lovely strawberriness? I pondered this as I rolled and cut a very short shortcake dough into squares (much less waste than rounds) and baked them golden. I made a recipe and a half, since I wanted large shortcakes fit for greedy people rather than little elegant restaurant-style ones. And I wanted some shortcake biscuits for breakfast as well, which were extremely rich and delicious. When it was strawberry-slicing-and-macerating time, I began to behave a bit like a mad chemist in the laboratory. I brought out big and little bottles of essences, flavorings, extracts, liquers and vinegars. Although I ended up using several different things, restraint was my watchword. I wanted to play the subtlety card. There are a few different levels of flavoring, to my way of thinking. You can make something that tastes boldly of nutmeg, for example, which I find delightful, since I love nutmeg. You can make something that has a lesser amount, just a shade over a whisper of nutmeg. People will know there's something in there, a slightly haunting flavor that reminds them of something, but they just can't put their finger on quite what that flavor is -- unless, of course, they have very highly developed palates. And you can use enhancement ingredients so sparingly that the end result tastes exactly like the main ingredient, not the flavoring -- but it tastes more so, even more of itself. More like apples, more like butter -- or more like strawberries. The flavorings on this last one are so very subtle that people simply think you've managed to get the very best strawberries (or whatever you're using) ever, just for their pleasure. So that was what I set out to do. A teaspoon, no more, of eau-de-vie de framboise went into my sliced strawberries. Two drops of rosewater and two drops of orange flower water. A half teaspoon of blood orange vinegar, and a heaping teaspoon of sugar, just enough to get the strawberries to release their own juices. All that was left to play nicely together while shortcakes cooled, dinner was eaten and later cream was whipped (in an overly hot kitchen, but we avoided disaster). "Mmmmm," said G through a mouthful of shortcake, whipped cream and berries. He had never had biscuit-style shortcake before, only the sponge-cake kind. Or even worse, the artificial snack-cake kind. "This is even better than Little Debbie's strawberry shortcake." "Thank you, sweetheart," I said, barely restraining myself from this blatant baiting. "There are lots of things I can do even better than Little Debbie." Whatever berries or other fruit you may have on hand, try the shortcake. You won't be sorry, although Little Debbie may. To make the biscuits: In an electric mixer combine the flour, sugar, baking powder, and salt. Add the butter and mix together until it resembles coarse meal. Add the cream and mix just until the dough comes together (it will be wet and soft). Turn the dough out onto a sheet of plastic wrap and shape into a 9 inch square, about 1 inch high. Wrap up the square and chill for about an hour. Preheat the oven to 350 degrees. Cut the dough into 9 biscuits (you can simply cut into squares or use a round cutter - remember the biscuits will expand in the oven). Brush the tops of the biscuits lightly with cream and sprinkle the turbinado sugar over them. 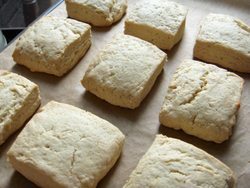 Place the biscuits about 2 inches apart on a parchment lined baking sheet and bake for about 20 to 25 minutes or the biscuits are golden brown. Transfer to a wire rack to cool. Combine the strawberries with the flavorings and sugar, and let them macerate until you're ready to assemble the shortcakes. Chill your bowl and beaters -- and if it's very warm weather, you might even put the cream in the freezer for a few minutes. Whip, and when it begins to thicken, add the sugar and vanilla. Stop whipping when soft peaks form. Split 4 of the shortcake biscuits in half and place the bottoms on plates. Put some of the strawberries on top and then cover with the cream. Cover with the tops of the shortcakes and serve immediately. Save the rest of the shortcakes for another day's dessert, eat them for breakfast, freeze them -- or have seconds. No matter what you call 'em, don't you just love this time of year?